I liked the rhythm of this, and so I set to work, actually writing the draft of today's poem right in my van, sitting underneath a streetlight in a grocery store parking lot. 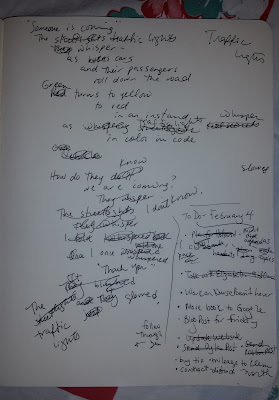 The original draft, as you can see, continues describing the "streetlights," and I was happy with it. Until. Until I looked up "streetlights" to see if it is one word or two. This is when I realized something that I already knew but somehow overlooked as I wrote. This poem is not about streetlights at all. This poem is about traffic lights! Streetlights are the lights on the side of the road, the ones that hang a bit over the road, giving white light to pedestrians and drivers. Traffic lights are the ones that change colors, telling drivers when to go, be careful, and stop. Several weeks ago, I wrote about how reading and learning new things can make a writer realize that she or he needs to abandon an idea. Well, today, I must share that sometimes a writer makes a silly mistake and needs to go back and fix it! This is just what I did last night. See the cross outs? Please, never be afraid to look at something that does not work and change it; that's what we writers do. Did you notice how the line breaks in today's poem move across the page? I did that because I wanted the reader to feel, just a wee bit, like a rider in a bus or car. And do traffic lights really whisper? No. That's just a bit of personification. I do like to pretend that the lights whisper to each other,though, telling secrets about us humans coming by in our buses and cars. So, remember! Make changes when you need to . And listen. Sometimes a line of poetry will just sneak up and tap you on the shoulder, maybe even at a strange time such as when you are sitting in traffic. Tricia is hosting this week's poetry party with Pablo Picasso's cat over at The Miss Rumphius Effect. Visit her wise blog to find out who is sharing which poetry gifts and links, all around the Kidlitosphere, all week long. As always this is a terrific post for teachers, students, poets and people of all kinds.I love your poem. It is one I will share with kids and use. You are a born teacher and gifted writer, my dear, but this is not news. I am so lucky I learned about you from teacher Melinda Harvey, but I would have met you some day I am sure. It was a long journey for me to find the poetry for kids group and while I have been "away" I know this is where I want to be. I feel very blessed. Can't wait for more of your books to have their birthdays!! Just a little bit of personification is all it took to make this poem special: a little friendly, a little eerie...well done! Amy--I always love reading your poems and the process behind them. To me the magic of poetry happens when a poet shares her vision of the world and influences my own. I thought it was tires whooshing down the road, but now I hear the whispers of the traffic lights. Thanks for making my world a bit more poetic! What a fun poem, Amy! I have had more than one poem sneak up on me in the car. Thanks for sharing! What fun to imagine the traffic lights whispering! I appreciate your sharing the draft with its impressive scribbles. I really enjoyed the Valentine poems, too! You're so wise, my dear. I love that glowing traffic light! I love the idea of traffic lights whispering in code... just a lovely in-the-moment composition, Amy! I enjoyed the collection of poems today and the lessons as well. Thank you! Your traffic lights are so kind, helpful, and sweet! After that first whisper, I was imagining the lights conspiring to disrupt the flow of traffic!! Yikes! I need to shift my brain towards a kinder, gentler view of the world!! I love that you wrote in the voice of traffic lights, Amy. One of my favorite "old" picture books is Red Light, Green Light by Margaret Wise Brown and your poem brought it back so vividly. It's a comforting poem, isn't it? 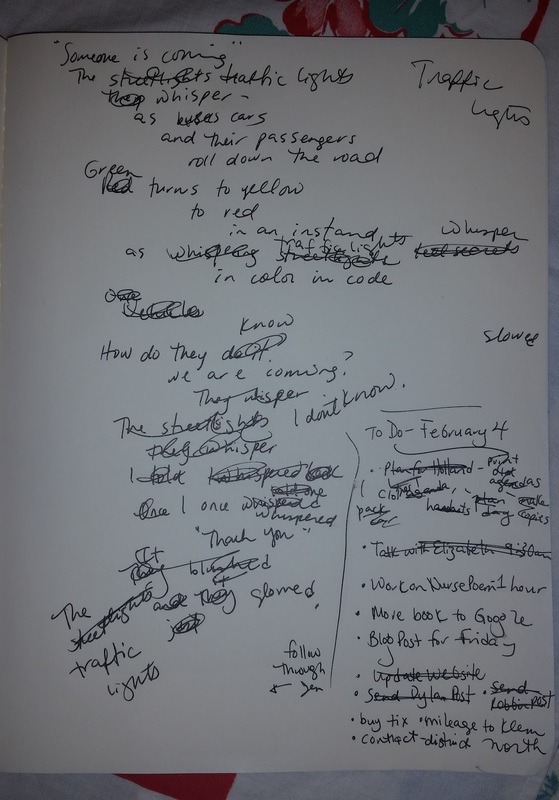 I love the story of this poem-- how it came when you were in the car, how you sat in a parking lot and wrote, how you discovered you had used the wrong word, and also about the line breaks. I always learn so much about writing poetry when I read your posts. And I always love hearing you read your poems out loud. I can't wait to share this one with kids. I'll will be listening for the whispers of the traffic lights the next time I'm waiting at a red light. Thank you for sharing the story behind the poem as well. As always, I learn so much. I love how you are able to show such glow, such illumination to something so commonplace - but that's exactly what poetry is - allowing us to see magic in the mundane.